"No on Charter Amendment 1 & 2 Advocate" Hans Johnson, to appear this Sunday morning on KABC's News Conference. 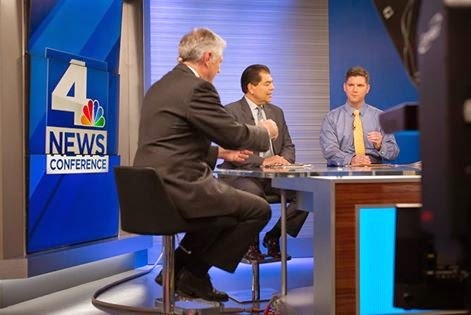 East Side (via Eagle Rock) Progressive Democrat Hans Johnson (yellow tie) in KNBC Studios. Eagle Rock resident Hans Johnson, President of the Eagle Rock/NELA based East Area Progressive Democrats, will be discussing Charter Amendments 1 & 2 with host Conan Nolan on 'News Conference' this Sunday at 9 a.m. on NBC4. "News Conference" is the longest running political/public affairs program in Southern California television. All candidates at objective and well attended forum Friday 13, LA-32 are a no vote on amend. Thank you candidates, I really like the answers, ie local dialog buried beneath state, fed power struggle. WHY then does JH support. Could it be the 2 extra years of "public service" during realignment. I was also made aware of ability to appoint replacement should CM not decide to hold office for the entire term. In fact Jose H may have made deal when Kevin D snuck into his office via the gadoy door, allegedly...Glory is right again, special interest. Of course. I have worked on several grassroots campaign and it is nearly impossible for us to get any oxygen in an off cycle election. Run our city elections at the same time as State or Federal elections and they will get zero coverage. No small grassroots campaign will be able to compete.